The new Tech Plus Short Sleeve Protective Top uses a flexible, soft compound foam positioned at the centre front chest, collar bone (clavicle) and cervical vertebrae providing upper body protection. The Vest also has a large CCC logo on the chest with a smaller one at the centre front neck. Flexible compound foam positioned at centre front chest, collar bone (clavicle) and cervical vertebrae CCC logos IRB approved. The Club Plus Headguard features a new interlock design with moulding technology which allows for 20% more thickness to the padding on the same size headgear. The flexible closed cell foam provides excellent impact absorption and allows excellent fit adjustment. 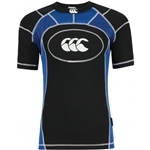 The headguard has a large CCC logo to the front and is IRB approved. The new Canterbury VapoDri Pro protective vest. EVA foam plates provide protection for shoulders, biceps, and kidneys. Centre back and shoulder mesh ventilation. Under arm gusset for increased comfort and movement. Perforated Canterbury logo. IRB approved.